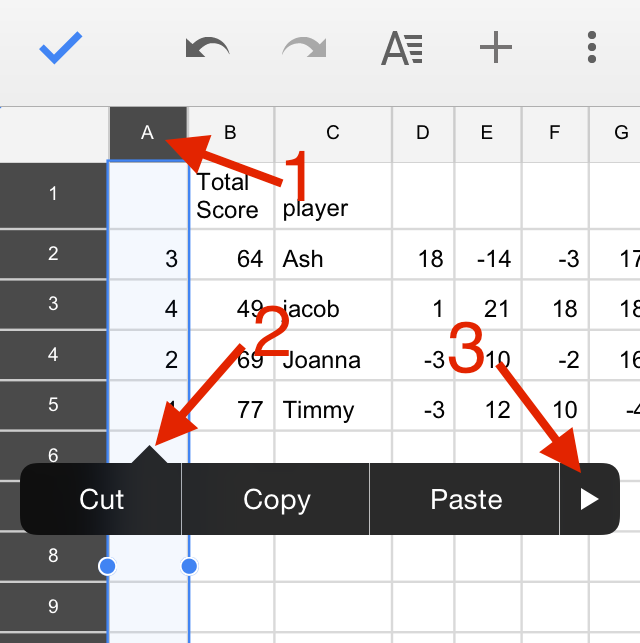 I love using spreadsheets, and now I can use them everywhere I go with Google Sheets. A free alternative to Microsoft Excel, Sheets has both a mobile and a web version. While it does not have the full range of capabilities of Excel, Sheets works well with the touch interface of a mobile phone. I would not use Sheets to manage large datasets or do any serious computation, but it has the functionality that I am likely to use on the go. Google Sheets can be used offline, or it can sync with your Google Drive so that you can pull up all your Sheets on any computer or device. If you do not already have the Google Sheets app, you can download it by following these links for android or iOS. One of the drawbacks of using spreadsheets on a mobile device is that fitting large amounts of data onto a small screen is difficult. For example, when I am using Sheets to keep score for a game, it is hard to remember which player is in each row, especially if the game goes on for several rounds. I like to freeze the column that has all the players’ names, so when I scroll over through later rounds, the names are still displayed. 1.To freeze a column, select it by tapping on the letter header for the column. 2.Tap anywhere in the column and a menu of options will appear. Press the arrow to the the right until you see the option to freeze rows. Note that if you are trying to freeze a column other than column A, you will have to freeze all the columns before the one you selected. For example, if you are trying to freeze column B, you will need to freeze two columns: A and B. 3.The process to freeze rows is the same as described above. Just select a row by its number and follow the same procedure.